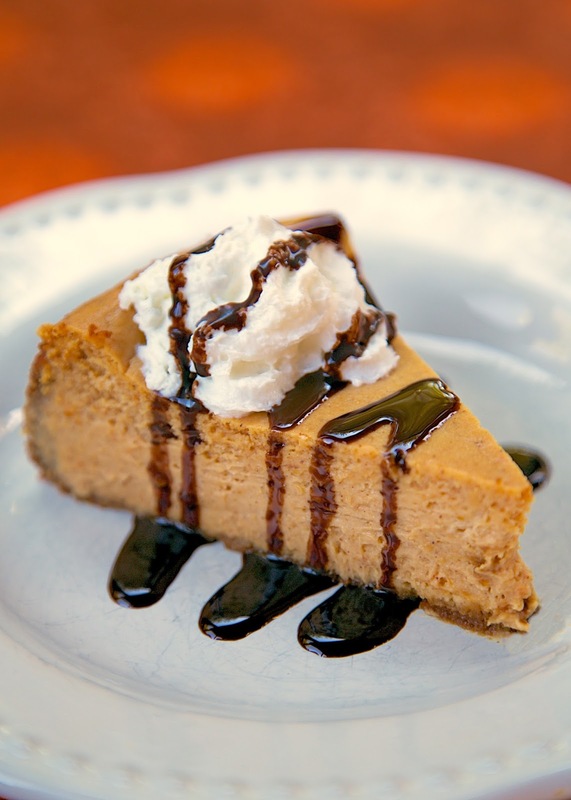 Disneyland's Pumpkin Cheesecake Recipe - great dessert for the holidays. Ready for the oven in 20 minutes. SO delicious! Biscoff cookie crust filled with cream cheese, sugar, pumpkin, eggs, evaporated milk, cinnamon and nutmeg. 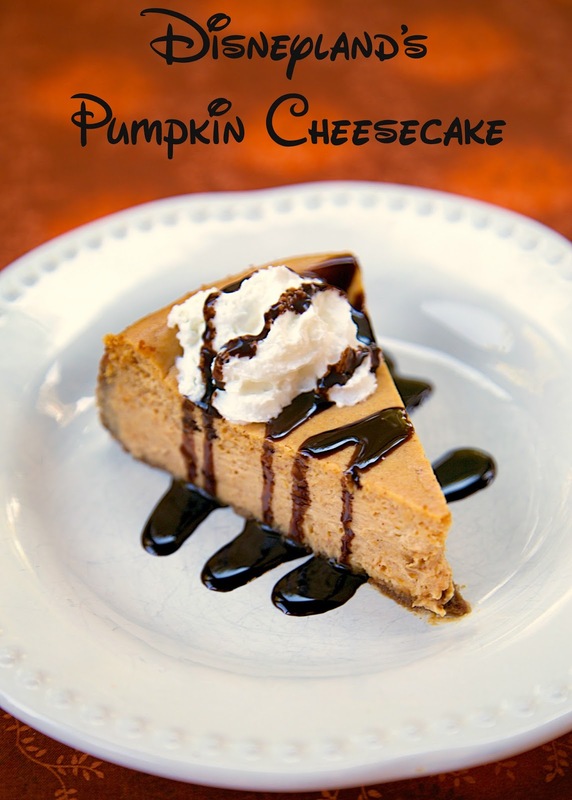 Even pumpkin haters LOVED this delicious cheesecake recipe! I follow the Disney Parks Blog. They write about happenings at Disney World and Disneyland. They also share recipes from time to time. When recipe for Disneyland's Pumpkin Cheesecake popped up in my feedly reader, I knew I had to make it for the holidays. This cheesecake was very easy to make. I was able to whip it up in about 20 minutes. It turned out delicious! I knew it would. Disney does't make bad food. I did make a couple of small changes. I used crushed Biscoff cookies for the crust. The original recipe used graham cracker crumbs, sugar and ginger. I thought the Biscoff cookies were a great replacement. I had a little bit of batter that didn't fit into my springform pan. I filled the batter to the top of the crust and tossed the extra batter. In a bowl combine the crushed Biscoff cookies and melted butter. Press crust mixture into bottom of 9-inch springform pan. I use a measuring cup and it works great. Place pan on a large piece of foil and wrap foil tightly up sides and around pan. (this will keep the butter from seeping out of the springform pan into your oven). Beat cream cheese, brown sugar, and granulated sugar together in the bowl of an electric mixer fitted with the paddle attachment. Add pumpkin purée, cornstarch, cinnamon, and nutmeg to cream cheese mixture, beating until well combined. Slowly add evaporated milk, mixing well. Slowly pour cheesecake filling onto crust mixture in prepared pan. Bake for 60 to 75 minutes, until center moves only slightly when shaken. Remove cheesecake from oven and allow to cool. Wrap pan in plastic wrap and refrigerate at least 4 hours before serving. Drizzle with chocolate syrup before serving. I just started following the Disney Food Blog. It's amazing. I love that you used Biscoff cookies for the crust! That slice of cheesecake looks like heaven. The cheesecake looks amazing! I plan to make it this week but can't find the pumpkin puree. Will canned pumpkin work? Disney chefs really have it going on when it comes to desserts. I know someone who trained in their culinary program, and it's such a treat (literally) when I get to eat something he has cooked. This recipe looks fabulous, and I'll be sure to give it a try. - Thanks!